Does a sports organization have the right to tell a player she’s too fat to play in a tournament? 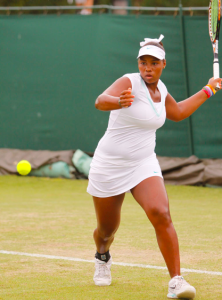 That’s the question surrounding Taylor Townsend, a 16-year-old tennis player in the U.S. Open juniors tournament. Townsend is a sensational player, ranked number one for junior girls in the world. She won both singles and doubles in the Junior Australia Open in 2019 and the Wimbledon Junior Girls Doubles, and USA Today and others have even compared her to the Williams sisters. However, she’s also bigger than most of the girls she plays against. Because of that one fact, the U.S. Tennis Association decided not to fund her trip to the U.S. Open. She has been under their wing in their player development program, living full-time at the center for several years now. Her coaches decided that until the budding star slims down, they would not fund her attempts at getting into the U.S. Open. She will also not be able to attend any tournaments out of their pocket. So, Townsend’s mother did what most mothers would do who believe in their daughter’s dream: she funded the trip herself. Townsend showed up at the tournament and is doing well so far; ranked as the No. 1 seed in girls singles. To be fair, the U.S. Tennis Association is essentially Townsend’s employer, and they say they have her best interest at heart. They’re not denying her entry into tennis tournaments, they’re just not helping her get into them. “Our concern is her long-term health, number one, and her long-term development as a player,” said USTA’s general manager Patrick McEnroe. But isn’t physical activity, like playing tennis, a good way for the teen to shed some pounds? She must already be on a strict diet and fitness plan, and her extra pounds don’t seem to be holding her back when it comes to winning tennis matches. Besides, if America knows anything it’s that telling an impressionable young girl that she’s fat can reap severe emotional and physical problems such as an eating disorder. Let’s hope the Tennis Association figures that out. Michael Strahan Named Ripa’s New ‘Live’ Co-Host: Is he Fit Enough for the Job? Sarah Shultz is a connoisseur of trying new things, from food to hobbies. As a recent graduate of Central Christian College she is working on trying life in the real world. When she isn't hanging out at the DIR office she enjoys healthy baking, running, and cycling.